Big Compute for everyone ! As modern scientific and engineering problems grow in complexity, the computation time and memory requirements increase and parallel computing becomes a necessity. Proactive Big Data Automation is a packaged solution to run and govern end-to-end Big Data and ML processes. ProActive integrates with de-facto standards in scientific and engineering environments. Seamlessly parallelize your scientific models and programs from your favorite interactive environment (R Language, Matlab, Scilab). Use Spark and Hadoop platforms from ProActive. We know that a single language cannot fit for every use case, calling for interoperability between multiple languages and services. Create a workflow of multidisciplinary tasks. Enable business line users to access the cloud capacity through a user-friendly & powerful interface. 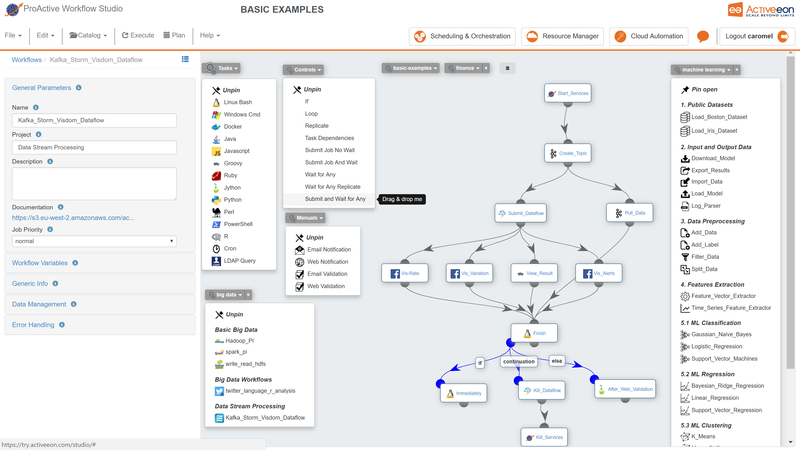 Translate business needs and processes into expressive workflows and execute them at scale.